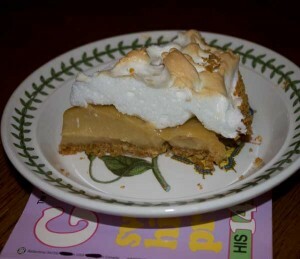 An easy butterscotch pie recipe topped with meringue. Preheat the oven to 350 degrees F. Grease a 9 inch glass pie dish. Combine graham crackers and sugar in a mixing bowl. Stir in the butter. Press mixture into the pie dish and bake at 350 degrees F. for 8 minutes. Let cool while you make filling. Whisk the egg yolks together in a bowl and set aside. In a medium saucepan that is not yet set over heat, stir together the brown sugar, flour, and salt; set aside and prepare meringue. Combine the egg whites and the salt in a metal bowl and beat with an electric mixer until soft peaks start to form. Add the sugar 2 tablespoons at a time until the sugar is dissolved and stiff peaks form. Set it aside and proceed with the filling. Warm the milk in the microwave for 1 ½ minutes. Set the saucepan with the brown sugar mixture over medium heat and gradually whisk in the warm milk. Continue to whisk over medium heat until mixture begins to simmer. Gradually whisk about a cup of the milk mixture into the egg yolks, then add the egg yolk mixture to the saucepan and continue whisking and stirring over medium heat until mixture thickens and bubbles. Whisk and stir for another 2 minutes. Remove from heat and whisk in the butter and vanilla. Pour into the prepared pie crust and quickly top with the meringue, sealing the edges. Bake the pie for 10-12 minutes (or until nicely browned) at 350 degrees F. Let cool at room temperature for an hour, then transfer to the refrigerator and chill for 4 hours or more. There are lots of ways to make butterscotch pie. Most recipes involve adding the butter at an early stage, but with this one you just throw it in and the end. If for some reason you accidentally cook the egg yolks, strain the custard before adding the butter and vanilla. As for the meringue, most people make it at the end. I like to do it early (I've never had problems with it sitting for 5 minutes) so that I can put it over the hot pie filling right away.